The wreck known for many years among local divers as the “Pug wreck” has been identified as that of the covered steam lighter “New York Central No. 14 (ii).” The identification of the wreck was made by Eric Takakjian after conducting a series of dives on the site over the 2006-2007 seasons and performing thorough and detailed archival research. Takakjian directed a team of divers from the crews of both the QUEST and GAUNTLET, who worked together in collecting data and measurements, as well as photographs and video footage. The New York Central No. 14 (ii) (NYC 14 II) was built at the Staten Island Shipbuilding Corporation on Staten Island, New York, in 1916. The NYC 14 II was constructed for use as a steam lighter for the New York Central Railroad. This was in fact the only vessel built by the Staten Island Shipbuilding Corporation for the New York Central Railroad, which later became Bethlehem Steel. Though the NYC 14 II was constructed as a replacement for the NYC 14, there were no sister ships to the NYC 14 II, which made this vessel truly unique and all the more challenging to identify since no other documented vessels that could serve as comparators existed. Obtaining precise measurements of the wreck. The wreck measured 113.9” length overall. The length between perpendiculars was measured at 109.7” and the wreck was measured to have a beam of 31 feet. The depth of hold was estimated at >12 feet. An accurate measurement of this parameter could not be obtained due sanding in of the wreck’s interior, and the hulk having settled into the sea floor to some extent. Physical observation/measurement of key features of the wreck. This included observation of old synthetic line that was 1960s vintage. Additionally, measurement and placement of the following: stem bitts, kevel cleats, hatch location and dimensions, aft capstan foundation, and steel flanges that would have been attached to the deckhouse structure. General observations: elliptical stern, presence of wooden guardrails. These were known characteristics of the NYC 14 II. Observation of a single-cylinder direct-acting steam engine, an oil-fired boiler and two large water tanks. Exclusion of the wreck has having been built by T.S. Marvel based on an exhaustive search of T.S. Marvel records, compiling a list of all vessels built by T.S. Marvel from 1886-1914 – none of which matched the specifications of this wreck. The wreck was previously thought to have been built by T.S. Marvel based on a steam gauge that had been previously recovered. After its long service as a steam lighter, review of certificates of enrollment the revealed the NYC 14 II was sold in February 1962 to Capt. E.S. Wilcox of New London, CT. One month later, the vessel’s enrollment was surrendered and the NYC 14 II was lost to further documentation. First-hand accounts indicate the NYC 14 II was used as a storage facility and eventually became a floating office for the Ross Towboat Company in the 1960s after their office was destroyed when the Boston T Wharf collapsed. In 1979, Ross Towboat was purchased by Boston Fuel Towing Company. 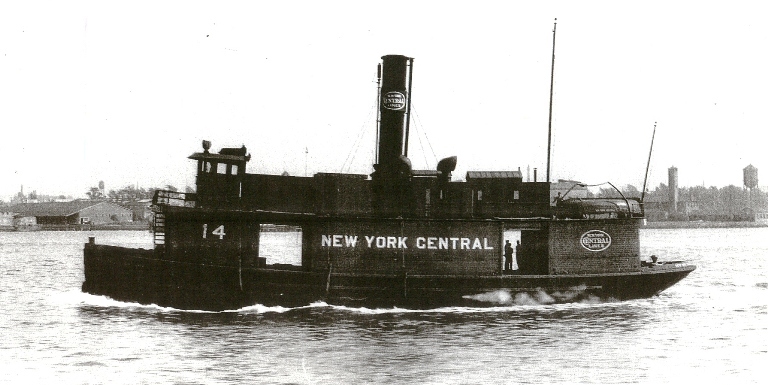 There is no record of the NYC 14 II being part of Boston Fuel’s vessel fleet and thus it is believed that the NYC 14 II was scuttled sometime before the sale of the Ross Towboat. This establishes a fairly wide window, placing the sinking sometime between the mid-1960s and 1979. Research efforts to uncover further details pertaining to the sinking are ongoing. The NYC 14 II was originally located in 2002 by Bob Foster and presently rests in 120 feet of water in Massachusetts Bay. The main deck can be reached in approximately 105 feet of water. All of the upper structures, such as a deckhouse or pilot house, are gone. Some smaller structures such as kevel cleats and stem bitts remain. Sections of the deck are peeled back along the edges in some areas. The hatches that access the interior of the wreck are intact and open. The engine and surrounding machinery are present and exposed. Two large water tanks forward of the boiler can be found inside the wreck. Inside the wreck, areas of living quarters and work spaces can be seen. The seafloor in the area is a mud/clay composition and visibility at this site tends to be lower than average at about 10-15 feet. Certain times of the year the visibility can be much better, but it is generally highly unpredictable. Currents at the site are light and the wreck is easily navigable given its small size and the intact nature of the hull itself. The hull is also covered in anemones and a multitude of marine life typical of the area. This wreck also makes a good site for advanced recreational or entry-level technical diving training, as it is relatively free of hazards, provides for a platform by way of the open deck and rests at a depth convenient for introducing students to real gas management and decompression planning concepts.